Charlie & the Chocolate Factory: An Abridged Version of the Original Best-Loved Story. 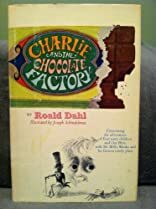 Charlie and the Chocolate Factory and its sequel, Charlie and the Great Glass Elevator, along with Roald Dahl's other tales for younger readers, make him a true star of children's literature. Dahl seems to know just how far to go with his oddball fantasies; in Charlie and the Chocolate Factory, for example, nasty Violet Beauregarde blows up into a blueberry from sneaking forbidden chewing gum, and bratty Augustus Gloop is carried away on the river of chocolate he wouldn't resist. In fact, all manner of disasters can happen to the most obnoxiously deserving of children because Dahl portrays each incident with such resourcefulness and humor. 6/21/2010 Mitch Leff said: It's awesome! 10/23/2009 Lisa Gibson said: Love any Roald Dahl. So easy to fall in love with the fantastical world and happenings in C&tCF though. 8/2/2007 John Zeleznik said: Classic!